Dallas 1908 and other artwork by artist G. Harvey can be viewed in our artist slideshow. 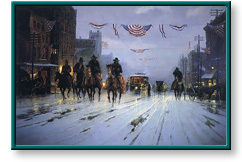 Dallas 1908 by artist G. Harvey and other Gerald Harvey art, art work, artwork, canvases, giclees, images, limited editions, open editions, paintings, paper, pictures, posters, and prints can all be found at Christ-Centered Art. Dallas 1908 depicts a bustling turn-of-the-century winter scene where cowboys on horseback, trolley cars, and horse carriages traverse down a snow-covered Main Street in Dallas. Image Size 17.75" x 26.5"
Dallas 1908 by artist G. Harvey as well as other open and limited edition cityscape, Civil War, Focus on the Family, oil industry, rural, and western paper art prints and canvases, giclees, images, lithographs, paintings, pictures, posters, and reproductions by renowned Somerset Fine Art and Somerset House Publishing artist G. Harvey can be viewed and purchased at special sale prices at Christ-Centered Art.